Fair warning, this isn't going to be a usual movie spoof article. There is a humorous fake sequel poster, so don't be too alarmed, but I'm not going to provide a short plot summary of said spoof. 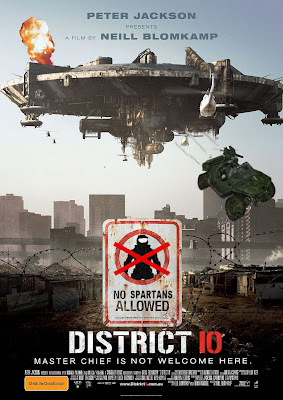 Instead, I'd like to discuss the events that led up to the filming and release of "District 9", given that it has a somewhat tumultuous history. The original movie project that director Neill Blomkamp was hired to helm was the "Halo" movie. This was to be a large budget, live-action feature film adaptation of the popular Microsoft-owned, Xbox-exclusive shoot franchise of the same name. The film rights were optioned by 20th Century Fox whom hired Peter Jackson, director of the Lord of the Rings film trilogy, to produce the film. Jackson quickly made it known that had no intention of directing the film, but only wished to oversee its development. Early discussions regarding the director of the film were center on Guillermo del Toro, who instead went on to helm an adaptation of "The Hobbit," which is still in pre-production. Finally, the job was awarded to first-time studio movie studio director, Neill Blomkamp. A short science fiction film entitled "Alive in Joburg" was the reason that Jackson decided upon Blomkamp to fill the role. By this time a script had been produced and budget estimates were in the $300 million range, causing 20th Century Fox to understandably become worried about their potential to profit on the film. Rumors also suggest that the choice of Neill Blomkamp, a virtual unknown quantity in professional filmmaking, pressured Fox executives to finally place development of the Halo film on indefinite hiatus. The halting of the project, however, was not the end of the working relationship between Jackson and Blomkamp. Jackson encouraged Blomkamp to expand upon the ideas in his short film and to develop it into a full-length feature film. District 9 is the product of those efforts. I felt this story deserved mention here because too often film studios seem to want to take the safer path when developing films. It would be too easy to blame the executives, but placement of such blame is unwarranted. They are in the business of making a profit, after all, and they need to do what they feel is best for their business. However, these series of events highlight the success that can occur when a filmmaker is given the freedom and the means to let his imagination run wild. As a result of Jackson's encouragements, we now have what may well be regarded as the best science fiction movie of the past several years. One can only wonder how many other Blomkamps are out there, just waiting for their chance to impress.